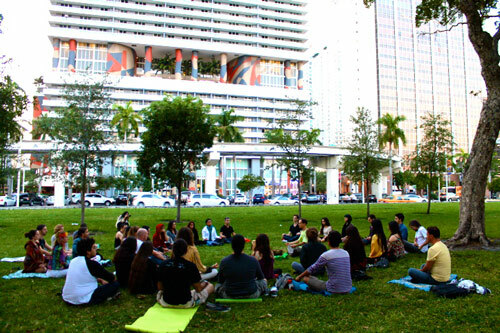 A public meditation series held in Bayfront Park, downtown Miami. Featuring guided meditation and toning bowl healing, the concept intended to reintroduce an appreciation of the sacred into the urban space. 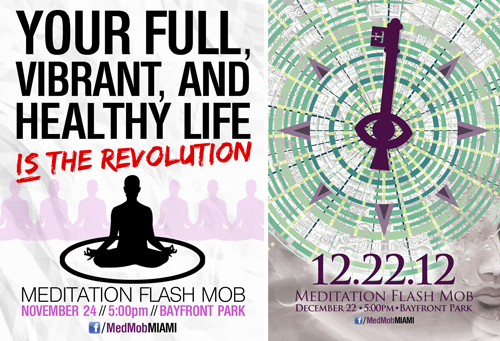 For the first event, the design used the familiar meditation pose imagery offset with bold and graffiti subtext to create a sharp contrast. The second edition which took place on December 21, 2012 incorporated the mystical symbolism of the eye of horus overlaid on top of Mayan calendar stone carvings that suggesting setting deliberate intentions to map ones way through the transition.